We usually take a low-key approach to birthdays, celebrating simply and without a lot of waste. It's perfectly okay to skip the bouncy castle, licensed characters, and over-the-top themes. Kids need love, excitement, and cake. Did someone else just breathe a sigh of relief? Good. I thought I'd better see what Elise had to wear. This sweet yard sale dress was forgotten in the 3T clothing bag. Wouldn't garden snails be cute for lunch outdoors? And just like that, a pink-and-green scheme was hatched. I flipped through my stash of yard sale ribbon and wrap, then carried a stack of pastel quilts from the bedrooms. So far, no money out of pocket--and the naturally wild centerpieces fit right into budget. I surprised Elise with this 25-cent Hull teapot from our Kentucky trip, then we got to work! We draped a lace cloth over my DIY crate table, where the sun erased those mystery stains, then piled leftover wedding bubbles into a $5 Goodwill bowl. 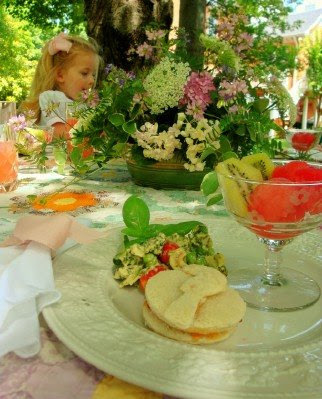 The menu: chilled fruit cups, pesto chicken salad, tea sandwiches cut into fanciful shapes, and pink lemonade. Dessert: angel food cake with strawberry whipped cream. The entertainment: playing with the birthday gifts. Beautiful and thrifty! I'd love the chicken pesto salad recipe! Bravo! So far I've managed to be that parent that rejects the suburban norm for a child's birthday party. I've explained it to the kids by saying that I would rather put the $300-500 in their college savings accounts than spend it on a single day of fun. Interestingly enough kids always have tons of fun at our birthday parties (I've heard more than once, the sentiment "this is the best party ever") and also interact with each other more! I despise going to birthday parties where you can't even find the birthday child at the end to wish them a good day because they are lost in a sea of other children at Chuck E. you know where or some similiar place. The pesto salad was the one thing that didn't go as hoped. It really didn't taste delicious, and I wouldn't encourage anyone to make the same recipe I did. Oh well. At least it looked appetizing! Anyway, a simple party is perfect - that's definitely what I plan to do for #2 this fall! It was a beautiful party, Meredith! We have a tradition of having our birthday parties at home, with little or no expense outside our ordinary budget. The one time we had to venture to a different location for my daughter's January birthday, it was because the weather didn't cooperate. EVERYONE we invited, neighbors, school friends, etc, had RSVP'd yes (we were living in a 900 sf - they wouldn't have fit!) because they had had such a great time the year before - in our backyard, roasting hot dogs and marshmallows and playing hide and seek. Not a bounce castle or live Barbie in sight! Very fun! And you make it look like a million bucks. I think that you have to be one of the classiest ladies I know. Everythink that you do seems to exude lovliness, beauty, and elegance. I think that the photos are just charming, and it looks like the birthday party was a success! I DEARLY love my husband's extended family, but sometimes birthdays are a little over the top for me...it always involves inviting ALL the extended family over for a big meal, and it all becomes pretty overwhelming sometimes. I am just curious...do you just invite grandparents, or do you also invite a lot of extended family and friends? Every family seems to handle this differently, and I would be curious to know what the "norm" is for others! so very, very pretty! I know some big girls who'd love a party like that. It looks lovely and very grown up. I am just surprised that 3-year-olds would go for chicken pesto salad. However, if Elise was pleased, then that is all that mattered! My nephew will be 3 this weekend and I will be donning my hat for a dinasaur dig in the sandbox (filled with all sizes of dinasaurs that were purchased at a yard sale - $5 for a whole bin so the guests can take home their haul for pennies) He is all about dinasaurs now and of course my sister is focusing on what will make HIM happy. Food will be simple - pizza, veggies/dip, fruit tray, various cupcakes and of course, the dinasaur cake (and dinasaur ballons and dinasaur themed gift bags and dinasaur ---you get the picture). The whole point, in my opinion, is doing what makes the child happy since it is his/her special day! Awesome! Kids don't need over the top, they need something they can conquer and just have fun with. That's great! You amaze me. You are so talented. Wish you could help me with everything I do. Blessings sent to you this early morning from someone who could be your mom - and is so proud of you. Meredith, it's "practically perfect in every way" for a special little girl. How delightful! Was this a family party or did you include friends? That is always the big dilemma at our house. Please don't whisper that...shout it from the rooftops! Love everything and love the simplicity and the fact that it didn't cost 200 bucks. Joan, that sounds like a fun party, and I understand your not-so-subtle point. You would have to know Elise to know what makes her happy. She is a unique girl. She is unusually observant, she loves fancy party dresses, and nothing pleases her more than working in her little garden. In fact, she has been picking clover flowers "for my birthday party" for weeks now. Her favorite gift of all is that little yellow teapot. She has been using it to water her flowers ever since. Obviously, the chicken pesto salad is for the adults in attendance. The kids loved the pretty little tea sandwiches--cheese and PB&J among them--and ate every last bit of fruit. Katie, I have struggled with the nutrition issue with my own mom. She brought some food for Andrew's VBS lunchbox last week and I very unkindly pointed out that the other mothers would raise their eyebrows at a can of Sprite, a Little Debbie star crunch, and a pack of crackers. If it is an occasional treat, like a birthday cake or a special snack, I think the right thing to do is to focus on the intent and keep quiet. No one is honestly trying to poison kids (yours or mine). Although it can turn into a battle or a competition (Grandma gives me this!) ultimately it's not worth the relationship. People are more important than food. And that's something I have to remind myself EVERY time my mom visits. Family vs. friends for birthdays? My kids are the only kids in either of our immediate families, and no one lives very close, so I haven't had to deal with this on the scale that some of you do. I think the best plan is probably to invite a small number of friends, enough to make it festive, and then invite the special older people in a child's life to enjoy watching the fun. Oh, I love that Elise wanted a garden party. She seems to love to imitate her mother with arranging flowers, etc. 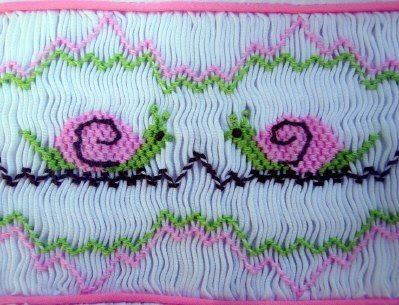 And the smocked dress with the snail a was perfect touch. Little girls are so different from the dinasaur boys and I think that is great. I'm sure she felt very grown up and special in the setting. It is just that most of the kids I know her age still do not have very sophisticated tastes! I would much rather plan a garden party than a dinasaur party and you are lucky that Elise got right into the spirit of it. Again, it ALL about what delights the child, in my opinion. And she was obviously delighted! Meredith - I just was thinking about that dress a few days ago - I saw a very similar one in a nearby boutique for $60 and wondered if Elise had grown into hers. The party looks lovely and perfect for Elise. Brenna has also been planning her party for weeks (and still has a few weeks to go!). We make a point not to go overboard - parties with friends are every other year and we limit the number of friends since our extended family is already party enough:) On the years we don't have a party we have a birthday dinner and a special experience with one friend. The out-of-control parties with too many kids aren't really fun for anyone! Oh, Meredith! It is SO beautiful. I want you and Elise to throw my next birthday party! This is the very picture of a storybook fairy's tea party. What lovely memories your princess will keep from this. I love this, Meredith. I'm in agreement with the low key, cost effective birthday party. It doesn't have to be expensive to be wonderful, as you illustrate many times over! I run a home based paper crafting business. My daughter is thrilled to have a stamping class here at home for her 6th birthday in two weeks. Merideth, you have inspired me. We will have cake on our fancy plates with table cloths from our wedding reception (10 years ago.) My mom made the white table clothes from white flat sheets from K-Mart! She is so excited about it! Now that's my kind of party! I love simple parties at home without all the fanfare. That's how we do it too. Mine aren't nearly as gorgeous and creative as yours, though. I would hire you if you lived in my town! I'll have to pipe in also and say the birthday party looked lovely! I love the way you take something and run with it (like the dress and coordinating the colors). Maybe I will eventually "learn" your natural creativity by reading your blog. ha. I enjoy seeing your creative ideas in every form. Thanks for taking the time to share them all! By the way, your daughter is so beautiful! I love it! It will be a party to remember. What a sweet little party for a sweet little girl. It's like something out of a fairy tale! I had to laugh as I agreed wholeheartedly with you message of simplicity. I just blogged recently about my obsession with over-the-top birthday parties for my son! He just turned ten last week and we had the best, most simple party. We took him and his two best friends out to eat pizza and go to a movie. It was the most relaxing party we've ever had! After years of planning elaborate but frugal birthday parties, I was burnt out. Last summer when my youngest turned seven my hubby said,"turn on the sprinkler, blow up some water balloons, and let them run wild." Sure enough, it was a huge hit. I even served a homemade chocolate zucchini(from my CSA) cake and the kids loved it. Such a lovely party. The little smocked dress is just the perfect thing for a birthday luncheon outdoors. Delightful table. And yes, a recipe for the chicken pesto salad would be wonderful. My mouth is watering.----aww, just saw your comment. Well, some kind of chicken salad sounds good---I'll have to get busy. We don't celebrate birthdays at all, but I am planning a small tea party in the upcoming weeks for a little friend and myself. Rest assured it will be a frugal event, but I hope to do it in a charming manner as well, as you have done for Elise. When did you surprise her with the tea pot? I see she was using itin the flower photograph before her birthday. I'm sure she loves it. I know my two year old would. We have tea parties every time we can be together, but they tend to be "spur of the moment" affairs of her making, more likely with pretend food! I am always so pleased when I see the wonderful things you do with your children. I am sure that the momeries made on birthdays will be the subject of many discussions between your children many years from now. What a wonderful and thoughtful way you show your children a good time and make their birthday special, and yet not spend a bundle. We are low-key party-doers too. Loved your little girl's dress and the theme that was created by it. I can't wait until my DD is bigger and we can have tea parties. She turns 1 this weekend and we are having a small cookout at home....it's beach-themed. I got lots of cute napkins/bowls, etc on clearance at Target for a quarter each and a cute seahorse shirt for her for $2.00. It's going to be so much fun! I was just getting ready to ask about the chicken pesto salad..., but nevermind, lol. I am right there with you about the big buck parties. I have done it a couple of times, but ONLY because my daughters begged for them and knew that the party itself would be our gift to them. I always let them choose what they want to do for their birthday and 9 times out of 10 they would rather have a small family gathering and a few little inexpensive (but useful) gifts to open. Super beautiful! I feel not good at party planning and it seems like such a lot of work, but I love seeing what you do. I grew up having very basic birthdays with immediate family only, and I am inclined to have very small events with our family -- just dinner, cake, a few presents and balloons...... but it is nice to share the special day with friends and invite more people over. My John's 3rd birthday is in July (soon!) and I need to get thinking about it..... We usually buy a store cake but I love that you made yours and John loves to cook and bake.... Maybe we will make cupcakes all together. I was tempted to do the beach cupcakes but my husband doesn't want the kids to have all the gum. Beautiful. I love that you're teaching that people are to be celebrated, but celebrations do not equal excess. And you're teaching her to be feminine in the process. Looks like a great party. I love your ideas! I am all for simplifying the celebrations! I couldn't stand how moms would try to outdo each other with huge and expensive birthday parties for kids when both mine were young. Often it was so obvious it was all about the parent that it would have been funny if kids were not involved. These photos were shot the same day. 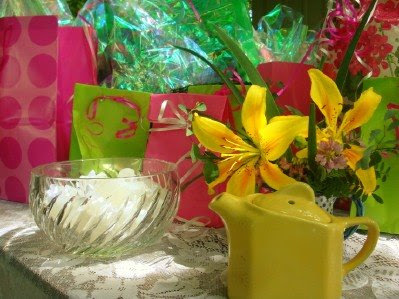 I gave her the tea pot when we first began to arrange the flowers, as I knew she would love using it for water. I thought we'd put flowers in it, too, but she was so excited to pour that she wouldn't let me! For my son's 7th we are pitching a tent in the backyard for a small sleepover and doing a campfire with smores. Your setup looked lovely. My husband and I have never had birthday parties for our children. We just use the day to make them feel special. Imposing on others to buy my children gifts always made me feel uncomfortable. So we set a budget for their gifts and they get to decide their "special" meal and the activity they want to participate in. I love this! In my opinion, this is better, more memorable, and more special than any Dora the Explorer or Disney Princess party with ridiculously priced paper products and enormous bouncy things. Way to go! I love this, how simply lovely. Just beautiful what a blessed little girl! I love this kind of party!!! You know me - that's what I've said all along. Simple is the best - in your own backyard. Lovely Elise. Such a dolly. wonderful ideas as always! My daughter's party will consist of a few of her friends doing crafts outside, and possibly getting airbrushed "tattoos" courtesy of my hubby. He may end up being the entire planner if I have to have surgery in the next few weeks to save the twins. Our frequent trips to Seattle to ensure I have her siblings is a far better use of the money! Lovely party. Lucky girl. Even luckier mom. I agree totally! We've always done pretty simple birthday parties. One year the twins birthday cake didn't even have any decorations on it- gasp! :) My motto is, "if they didn't need it on Little House, I don't need it". Ha ha. Love the decorate with what you have. Son C's 2nd birthday is coming up and you reminded me I have an ABC themed duvet tucked away that I can pull out out for picnic blanket or tablecloth. And I found a set of adorably tiny Golden Books at a yard sale last week--at 12/$1 they will make excellent party favors. It looks like a page out of Martha Stewart! Just Beautiful!! What a charming party. I wish I still had little girls to have sweet, little parties with. Our girls are now 19 and 17, and our three younger children are boys. I need someone to have tea parties with! 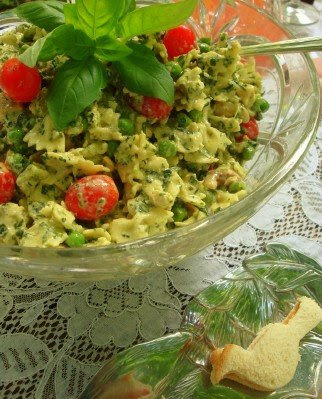 Our favorite pesto salad recipe is called "Pasta, Pesto and Peas" by Ina Garten. You can find the recipe on the Food Network's web-site if you're interested. I'm sure it would be really yummy with chicken added to it. To fellow readers who might be looking for inspiration on a frugal "themed" or "boy" birthday party, look in the archives for the lego birthday party Meredith's son enjoyed. This is stunning in every sense of the word. I've tried to keep the parties sweet and simple, but your example raises the bar on the elegance factor. Utterly delightful! You are a marvel, Meredith! Lovely! I'm aiming for simpler parties now, too. Thanks for the great example! That was similar to Em's 1st birthday party! And it was kept on the cheap! We are going simple to. This year we are meeting a couple other families at our favorite park with bread, meat, cheese, fruit and cupcakes.